Anky Technical Casuals or ATC was created by Triple Olympic Champion Anky Van Grusven who was convinced their was a need for fashionable attire, for both horse and rider that combined technical materials, optimal comfort, quality and usability. I can only speak for the saddle pads and bandages as god forbid I'd spend money on myself and therefore haven't been fortunate enough to own any Anky clothing, however after a cautious start I am now a convert and can't wait to tell you all about Anky!! So back to my cautiousness...it came from the pad design, no tabs...will it slip down and pull over Oscar's withers in PolyPad style? Are they too thick and puffy...will they alter the fit of my saddle? Overall, the general lack of security from the pads, I mean, they don't even have girth tabs...? And after taking the plunge and investing in an Anky matchy matchy set, I can truthfully confirm that none of the above are an issue for Oscar and I. Oscar has sensitive skin that rubs easily, especially at this time for year as his Summer coat peeks through and the luxurious suede pads black Coolmax lining is soft against his skin and unlike other pads hasn't made his hair loss worse. 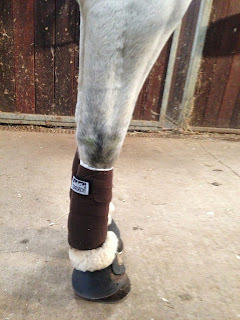 Alongside this he is never hot or sweaty under the pad, although it's thicker, it is always dry when taken off, even after the longest, fastest of hacks! I mentioned the pads outer material being suede, this was the design for Autumn/Winter 2014, it's deliciously soft with the word ANKY (dressage) or ATC (GP) in silver glitter anti-slip gel where the saddle sits to ensure a more stable position, if that doesn't put heart signs swirling around your head I don't know what will, they're so pretty! And it works. I place the saddle pad on, ensuring the pad is pulled up at the wither - the pads are anatomically formed at the upper end to curve up as opposed to pulling down - then the saddle, no tabs, no girth strap, girth up and perfection, it stays put. Anky bandages are 3.5 metres in length and made from quality anti-pill fleece wicking moisture away from the legs, I use them on their own as Oscar is a only 15hh, the length ensures I can wrap them around enough times to give adequate protection. I have used Anky saddle pads and bandages since Summer 2014 for long hacks, schooling, jumping and dressage lessons, and they've met my every need. Anky Silver is only one of the colours I've acquired, but it is a firm favourite, please let me know if you'd like to see more of our matchy madness! This morning, as I tacked Oscar up...which involves oh so much more than just a saddle and bridle, my dad laughed at Oscar's fluffy boots - the LeMieux WrapRound Lambskin Over Reach Boots - I jokingly call them his Ugg boots, but in truth they're well used in Winter and aren't just for show...it's just a coincidence that they look super cute, I promise. 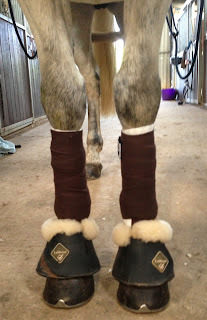 I use them because Oscar needs to wear over reach boots, both in the field and when ridden, and because the entrance to our paddock is muddy, on evenings when I ride I have to wash Oscar's legs off before I bandage and boot up. I towel dry his hair but due to his breed and that I leave his legs unclipped in Winter (only tidying with the Skylark Trimmer) they are never fully dry and the lambskin collar of the boot boot ensures he isn't rubbed. The outer leather shell and easy WrapRound design are the same on both boots, making them quick to whip on and off, and the lambskin collar is made from the softest Merino wool - Oscar wears Large in these (to cover his tall feet).